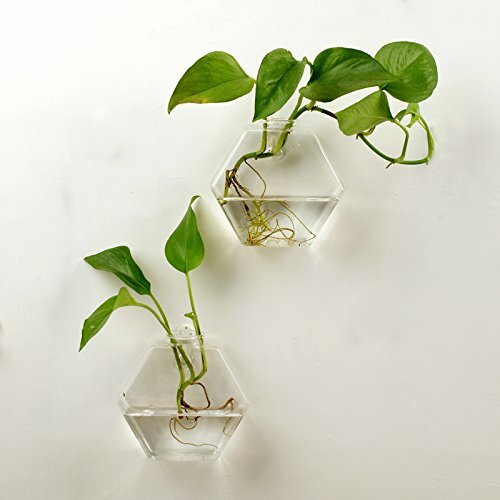 AWEVILIA Wall Hanging Plants Planter Terrariums Creative Fashion Glass Hexagon Shape Vase Home Decor Wall Plants Set of Two by AWEVILIA at Tulips Orchids. MPN: planter-6sizes. Hurry! Limited time offer. Offer valid only while supplies last. This item includes JUST TWO PLANTERS! No plant or other decorative objects included in this item! Size: Length 5.8", Width 2", Height 4.7". Material: high boron glasses which is thin and light. The small hole in the back allows you to attach this glass vase to any wall using appropriate mounting hardware. Easy hanging or taking off the wall. Fill with small plants, or other decorative objects and use as an eye-catching decorative accent for any space. Ideal for home, office, garden, wedding or holidays as a deco. It helps beautify and purify your place, a good decoration for you. If you have any questions about this product by AWEVILIA, contact us by completing and submitting the form below. If you are looking for a specif part number, please include it with your message. 3 X WGV Glass Hanging Plant Terrarium/Votive Holder, 4.5"